Portes Dorion has been manufaturing garage doors since 1948. This small company when it started with residential garage doors has become over the years an international company specializing in all kinds of industrial doors be it sectional overhead and vertical doors, rolling steel doors, multiblades doors, roll-up rubber rapid doors, etc. In the trend of the mega doors we have manufactured airplanes hangar doors, special anti-radar doors, craneway bay doors, top multiblades vertical door combined with bottom sliding door, telescopic doors, lock doors, etc. specific for each project. Portes Dorion also manufactures industrial motorized barrier gates such as cantilever gates that operate with a rack-and-pinion mechanism, swinging gates, etc. Our shop manufacturing is governed by our quality assurance program. All our welders and our welding procedures are governed and certified by the Canadian Welding Bureau (CWB). Our installers are all governed by the Commission de la Construction du Québec (CCQ) and hold their qualification cards. Our installers are also subjected to our quality assurance program via the installation methods and startups on the jobsites. We are registered with Cognibox. 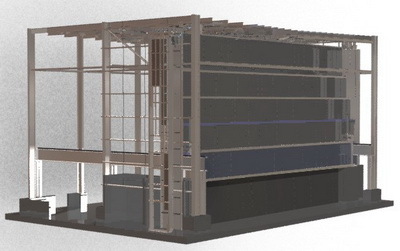 We have an engineering department that works on the design and on the development of special doors specific to projects and more than once following inquiries from architects and engineering consultants firms. All our doors can be designed and manufactured according to the owner's specifications. Portes Dorion has developed an overhead sectional door 102 mm thick that can withstand wind loads up to 2.5 kPa. One of our best innovations since the last five years is the fact that our electrically overhead sectional doors and our roll-up rubber rapid doors now operate without the assistance of torsion springs or counterweights. This innovation minimizes repair costs and the doors last longer. All commands to operate the electric doors can derive from separate control panels in which are mounted programmable PLCs and other components such as motion sensors, wind alarm, photocells and timers to have entirely automated doors. Aluminerie Lauralco in Deschambault who had many multiblades doors and vertical giant doors. Aluminerie Reynolds in Baie-Comeau and in Massena, New York, for which we have designed, manufactured and installed special doors for craneway bays. Norsk-Hydro in Bécancour where we had to find a solution to the magnetism problem that existed in some different areas. Métallurgie Magnolain in Shipton for which we have designed, manufactured and installed multiblades doors, overhead sectional doors, rolling steel doors, etc. Aluminerie Alouette in Sept-Iles for which we have designed, manufactured and installed from the end of 2003 to the middle of 2005, between others, 24 multiblades doors, 38 insulated or non insulated rolling steel doors, 5 rubber rapid doors, 1 horizontal sliding door for the brick oven, 1 giant multiblades door, rolling steel fire doors, 1 giant door for travelling cranes, 1 telescopic door. Fjarðaal Smelter projet in Iceland for which we have started manufacturing the doors at the beginning of 2006 and finished installing them in December 2007. Since September 2006 our personnel installed the doors as the buildings were ready. We mobilized an average of 21 to 28 days. On the 78 doors that we have supplied and installed, there were giant top fabric doors 27 m wide operated by Konecranes wire rope hoist motors combined with bottom bi-directional sliding horizontal doors. Our overhead sectional doors 102 mm thick were designed for this project to withstand minimum wind loads of 2.5 kPa. Our roll-up rubber rapid doors were designed to withstand minimum wind loads of 2 kPa. The overhead sectional doors and the roll-up rubber rapid doors were designed without torsion springs nor chain nor counterweights. Portes Dorion has designed, manufactured and installed the lock doors #3 and #4 for the Canal Lachine. Air Algeria in Algeria for which we have designed and manufactured airplanes hangar doors. Through the same engineering company in Montreal we have designed and manufactured overhead sectional doors for the Transport Department in Algeria. Base Aérienne de Tamanrasset in Algeria for which we have designed and manufactured overhead sectional doors and airplanes hangar doors. The hangar doors were installed by our personnel in 2006. Bombardier in Mirabel for which we have designed, manufactured and installed anti-radar hangar doors. Bombardier in Mirabel for which we have designed, manufactured and installed scissor doors. Air Canada in Dorval for which we have designed, manufactured and installed special doors for reactors testings. IMP Execraire in Dorval for which we have designed, manufactured and installed giant sliding doors and the special doors for the paint booth which were 2 sectional doors 30' wide and 1 central sectional door 40' wide with removable guiding rails. Our engineering department is always available to help architects or consulting firms build up particular technical specifications for projects that may end up on their drawing tables. Do not hesitate to contact us for any questions on conventional, special or mega doors for all kinds of buildings. 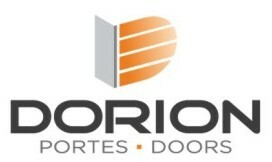 Copyright 2001, Portes Dorion Doors Inc. All Rights Reserved.